Because sheep are auctioned, you are guaranteed to pay the fair market price. You can see and compare a range of sheep from many different flocks before you buy. Rams are assessed and all sheep are inspected for trueness to type by the Society. 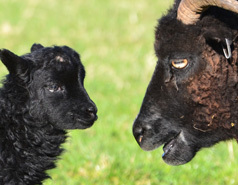 Buying a ram with little knowledge of its bloodlines and its breeder has inherent risk as he is the most important individual member of your flock because of the genetic influence he will have on all of his lambs. At one of these sales you will be able to compare rams, look at their bloodlines and have a discussion with their breeders and therefore be able to make a much more informed decision about this important purchase. There are many breeders present, as well as Society Trustees, who will be pleased to help you. For first timers, a sheep auction might be a daunting prospect but there is nothing to fear. The auctioneers are aware that they have a mixed audience and don’t rush like they may at a commercial farmers’ mart. Besides, if you don’t bid you won’t unintentionally buy. The best plan is to pick out a number of possible sheep to buy before the sale commences, decide what your maximum spend will be, and bid only for those sheep. Perhaps you will pay more than expected for one and less for another but make sure that overall you are within your budget. One final point – at Melton Mowbray and York sheep are sold in guineas (=£1.05). Historically the 5p [shilling] was the auctioneers' commision. Closing dates for entries and links to the sale catalogues will be added to this page when available. 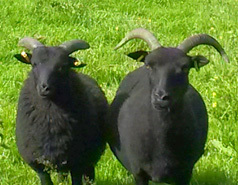 However, it is still possible to buy Hebridean Sheep - please check out our market pages or our links to members websites. Alternatively, contact the membership secretary to find registered flocks near to you.